Arnie Beyeler (right) determines which pitchers the Red Sox can take advantage of on the basepaths. 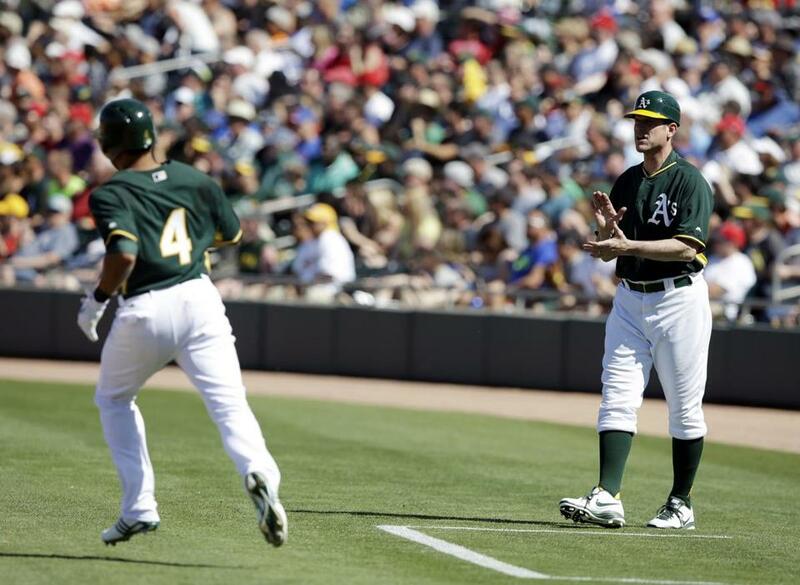 FORT MYERS, Fla. — When new University of Michigan football coach Jim Harbaugh visited the Oakland Athletics to watch a day of spring training earlier this month, he was given a uniform and allowed to coach first base for seven innings. After all, what harm could he do? Arnie Beyeler, who has coached first base for the Red Sox since 2013, understands how it looks. He’s the guy who fist bumps the batter for reaching first and keeps an eye on the pitcher in case of a pickoff attempt. Anybody could do that. 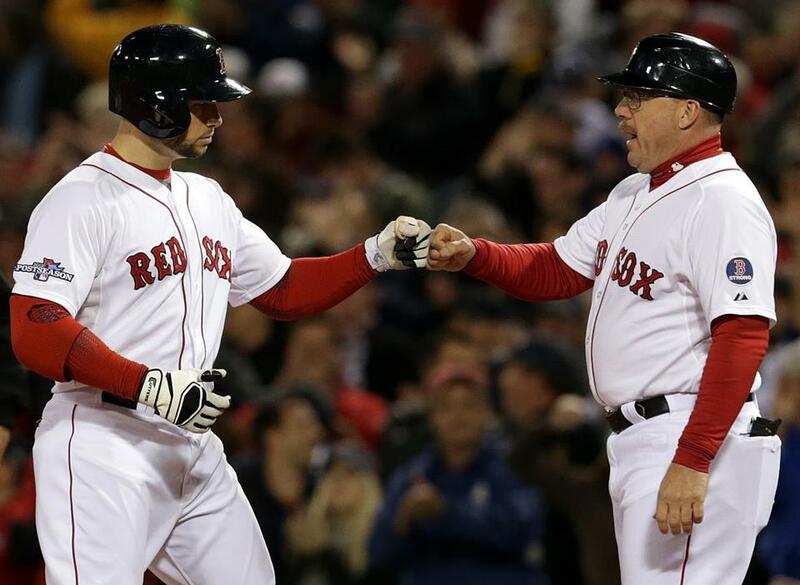 But the Red Sox and several other teams have turned coaching first base into something much more. In baseball’s information age, first base coaches are a way to gain an edge. Beyeler takes his post with a stopwatch in hand and a small black book in the back pocket of his uniform pants. When a batter reaches first, he times how long it takes the pitcher to release the ball after he breaks his hands while in his delivery. The information is relayed to the runner. Some players have the green light to steal second base on their own judgment, with others on yellow or red. Beyeler looks for opportunities to help those slower runners unexpectedly steal. “He’s our running game coordinator, essentially,” manager John Farrell said. The system has worked for the Red Sox, who have an 80.9 percent efficiency rate at stealing bases since 2013. That is well above the major league average of 72.5 percent during that time, and behind only the Kansas City Royals, who were successful on 81.8 percent of their steals. The Sox have been caught stealing 44 times over the last two seasons, the fewest in baseball. In 2013, Jacoby Ellsbury stole 52 bases and was caught only four times. But the Sox also got 13 steals from David Ortiz, Jarrod Saltalamacchia, Will Middlebrooks, Mike Napoli, and David Ross. They were caught three times. In most of those cases, Beyeler gave the runner a sign to steal because the pitcher was being particularly slow to the plate. Stolen bases almost always come off the pitcher, not the catcher. Through in-person advance scouting and the study of video, Beyeler determines which pitchers the Sox can take advantage of. He uses his eyes during the game to confirm that data. Beyeler has a routine between every pitch. He communicates with the runner then steps back to watch the pitcher. If a pitcher takes more than 1.5 seconds to deliver a pitch, he’s susceptible to a stolen base. As Beyeler records his observations, the odds get better for the Sox. “That book has everything,” Lovullo said. “Break times, good counts where the break times are the highest or what’s breaking first on his body. He basically controls the running game and gets them that information. He’s a resource while he’s out there. When Farrell became manager of the Toronto Blue Jays in 2011, he wanted the first base coach to be more involved than was tradition. Lovullo, the manager of the Triple A Pawtucket Red Sox, was his choice. The Blue Jays were successful on 71.6 percent of their steals in 2011, a tick below the league average. They were too aggressive, often running into needless outs. Mookie Betts, who stole seven bases in 10 attempts as a rookie last season, said the amount of information available is daunting at first. The Red Sox were 30 of 50 stealing bases before the All-Star break last season, a wretched 60 percent. They were 33 of 38 the rest of the season. Arnie Beyeler is called the Red Sox’ “running game coordinator,” by manager John Farrell. Beyeler, 51, played six seasons in the minors with Detroit before starting a career as a scout and then a minor league manager and coach. Managing 1,558 minor league games gave him the strategic background to coach first the way Farrell wanted it done. It’s not all numbers and percentages. Being the first base coach also means communicating with the umpires. Baseball’s replay system has eliminated arguments, but Beyeler still reminds the first base umpire about pitchers he thinks are committing balks. Beyeler also has the unglamorous duty of collecting equipment. Players who use shin guards or elbow protectors take them off when they get to first base and hand then to Beyeler. Sometimes he also gets batting gloves or sunglasses. “That’s a good problem to have, when I’m going out there to get stuff that means we have guys on base. I’m fine with that,” he said. Beyeler keeps the body armor with him, tucking it in the back pocket of his uniform pants. For Lovullo, it was the worst part of the job. 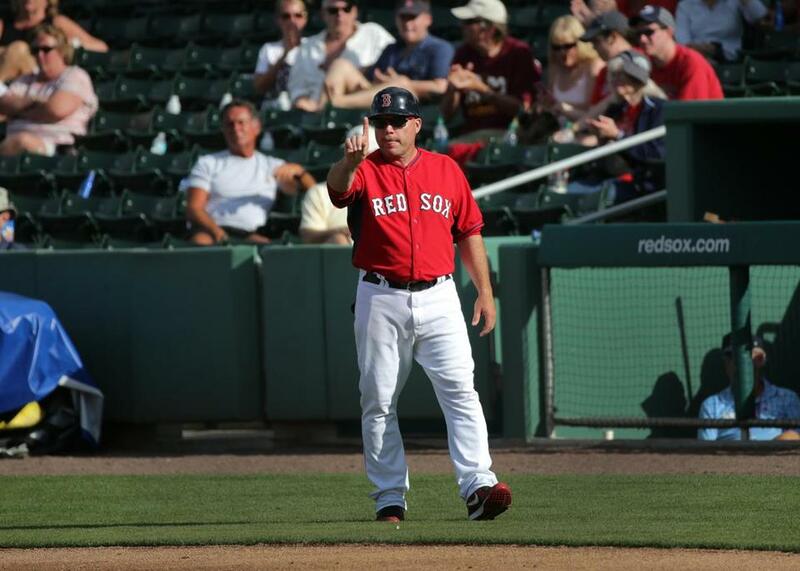 The Red Sox base coaches also stress, especially to young players, not to get caught up with chatting to the fielders. Beyeler and the Sox have a new challenge this season. Pablo Sandoval has not attempted a stolen base the last two seasons and is 11 of 23 in his career. Surely the Kung Fu Panda will stay put at first. “I wouldn’t count it out,” Beyeler said. Michigan football coach Jim Harbaugh coached first base for seven innings in a recent spring training game.